Finding Hobbit Hollow: Where do Hobbits live? I just put up the Hobbit calendar I got for Christmas. January is Gandalf opening the gate to walk up to Bag End. Very inspirational. I’m going to have to put a gate up somewhere on the property. Happy New Year to all and best wishes for the coming year! Which brings me back to the title of this post. Where do Hobbits live and where can I find a place that I can build a house for them? When I read “The Hobbit” for the first time my impression of Hobbits were of a people who enjoyed their privacy and had homes that big people could not find. That has always been my vision of Hobbits and their homes. When I built the shed this is basically what I had in mind. A place that people who are not aware that it is there would walk right by and not even know it existed. If you walked to the back of my property you would not be able to find the Hobbit shed unless I pointed it out to you. So the first problem I had is finding a building lot where a Hobbit house would be suitable. One of the main problems is that many of the lots that are available are in subdivisions where there are certain requirements for that particular subdivdision. One usually being that the neighbors are not interested in seeing something that doesn’t resemble a house like theirs. The second problem is that many of the sites just don’t lend themselves to building a Hobbit house on them. I know what your thinking. There has to be a hill, right? Actually, I was looking for a flat lot where I could bring in soil to cover the structure later. Or a lot were I could excavate the soil I needed to cover the house with at a later date. The third problem I found with many of the sites were complicated septic systems and extensive driveway and site conditions. A fourth problem was pricing. 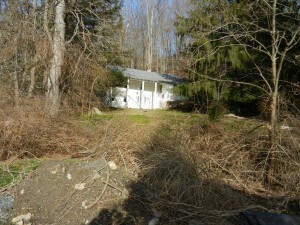 I thought with all the trouble in the houseing market I would surely be able to get a good deal on a piece of land. That was definitely not the case. It kind of sounds like the cards are definitely not stacked in my favor! I looked at quite afew lots over the course of a year or so. I eventually found this house. Purchased this home to build a Hobbit house on this property. This house, so I’m told, was built in the late 1700’s to early 1800’s. 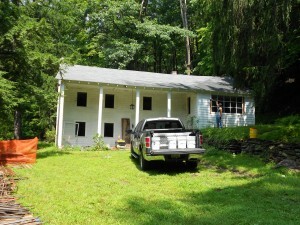 It is a four bedroom two bath colonial. And it was a complete mess inside and out. The ceilings inside are about six foot three high. When you walked in you felt like you had to duck. I guess if you were a four foot three inch hobbit this would have seemed on the high side. It was actually quite unbelieveable that someone lived here up until about 2006. The owner passed away and it was left to her estate. They were asking 170,000 for this mess of a house.The beauty of this place was not in the house but in the setting and the road it is on. A small spring fed stream runs parallel to the road right next to the house.To get to the house you have to cross over a small wooded bridge which,in my opinion, was totally not safe even for a small car. The other nice thing about this lot is that it is on a dead end road with only afew other houses. On top of that there are no other houses that are really next to it. When I first walked into the house there was a table with a gazzillion real estate cards on it. The listing for the house was very interesting and I was told that this place is” A diamond in the rough”. It is,the only problem is you have to build a bridge to get to it. That ,I guess, was the sticking point for most of the people who looked at the house. Not only do you have to build a bridge and renovate the house but the stream, it turns out,is a spawning stream for trout. Which further complicates the bridge building process. When I brought my wife to look at the place she loved it and said that this would be a perfect spot for the Hobbit house. When she went on to say that she would live in a Hobbit house on this property I knew I had found the right spot. The only problem was buying it. You would think that after trying to sell it for five years the estate would be interested in making a deal. The short version,I thought I paid to much and they thought they got to little. That was over a year ago. Every time I stop by the property I am struck by what a special place it is and how special it is going to be! Enjoy the rest of your day! I hope to be back in afew weeks to explain the bridge building process.